There are so many available mediums available for the average baseball fan that it is almost mind-blowing at times. Television, Radio, Internet, Cable TV, Social Media, Fantasy Leagues and even Blogs have all taken their place in our society to bring the fan every facet of the game we love. It is hard to believe how these things have impacted the way we look at the game, and amazingly all this has evolved over the last century. It is also hard to comprehend that at one point baseballs only consistent outlet was through radio, and it was a hard sell at that. Today’s book takes a look at the evolution of baseball first medium, Radio. 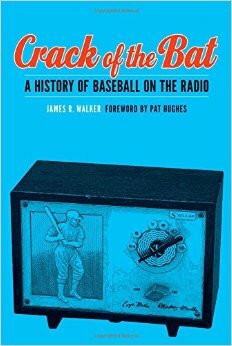 James R. Walker has written a book that takes the reader through the birth of radio in baseball. It chronicles the struggles that baseball had to overcome to become part of the American fabric. From scheduling conflicts to sponsorship rights and legalities between both the government and the teams, it is all covered in here so you get the full picture of the birth of baseball on the airwaves. The author walks you through baseball selling the rights to World Series games and how it eventually evolved into regular season games becoming the norm on the radio. This book also gives some very interesting facts about how the radio business operated at the time and how it effected the growth of baseball on the radio. It really was a convoluted system that impeded progress, but in the end the strength of baseball won out. Finally the book takes you through the unprecedented growth of the game and its parallel growth on the radio. It also shows how radio lent itself to countless generations becoming familiar with the game. I found interesting that it shows the decline of radio once it was challenged by other mediums such as television and how it changed radio broadcasts. Some people feel that radio is the truest medium in which to follow a game, which I think to some degree is true. It forces you to imagine from the announcers story as to what is going on out on the diamond. This book takes the reader back to a simpler time in society and shows the reader that even though baseball may not have realized it at the time, they were big business. There were some serious arguments over the baseball rights and substantial money was being paid to own those rights. Baseball fans will enjoy this book and the progression baseball follows in getting into american homes.